Skirts, do they often make your packing list? Packing light while still having lots of outfit options is all about choosing versatile pieces. A few weeks ago, I shared an example of one fancy velvet dress that I was able to dress up and down so I could wear it to multiple events on one trip. This time, I wanted to share tips for styling the same snakeskin skirt, three different ways. This one is the H&M calf-length snakeskin skirt. Dresses are fantastic, but in terms of versatility, skirts often beat them. That being said, they weren’t always my go-to because they only work if you have the perfect items to match. For this outfit, I thought about the occasional fancy winter event, like attending a gallery opening, or the opera, and styled something you could put together from simple items on your packing list. I really like the layered effect and how the skirt and the top have a summery feel while being grounded by a sensible turtleneck. All of these items pack incredibly thin too, so you can conjure an outfit from a very small carryon. The next outfit I put together is something I would wear to work in an office on a normal winter day. It can be impractical to commute in heels, so I usually suggest a sensible black bootie. I like mine with a little edge, so I tend to wear a lot of Doc Martens in the winter. I also wear a lot of turtleneck sweaters in the winter and this one is one of my faves. This outfit looks smart once you shed the winter accessories, and with the coat and kid-like mitts and hat, it’s playful at the same time. 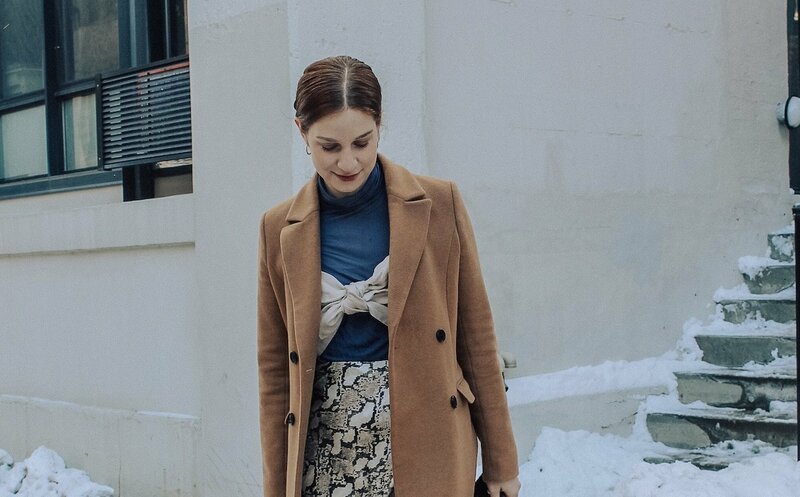 Wondering how to style a midi skirt without looking stuffy or precious? Try a sweatshirt and boots. I’ve been living in this fleece zip sweater this month and love to pair it with everything. With this outfit, I’ve played off the neutral hues of the skirt to choose accessories that are casual and unassuming. Adding a pair of beat up Docs, sweater, hat, and a cheap but funny tote make this a great outfit to run errands and just hang out on a Saturday. Hope this inspires you to wear more skirts this winter! Be sure to check out my post on picking tights so you stay warm.